"Enlisted" is in the same vein as "Stripes" and "Police Academy" (the first and second movies, not the crappy sequels). It follows the antics of a bunch of misfits (because, of course) of a Rear Detachment Unit in Florida. It's not easy to predict what shows will do well and what will get cancelled, particularly comedies. A few months back when "The Millers" debuted, I raved about it. After a couple more viewings, however, it was vanquished from my PVR schedule and I have no regrets. I loved "Back In The Game," but ABC cancelled it in November. I thought the network would do the same to another fave, "Super Fun Night" (an acquired taste), but has yet to yank it. I didn't find anything funny about "The Crazy Ones," count myself the lone critic who isn't a fan of the acclaimed "Brooklyn Nine-Nine," and while I didn't despise "Dads," I figured everyone else would, so I forgot to watch it. But then a funny (read: not funny) thing happened: "The Millers," "The Crazy Ones," "Dads" and "Brooklyn Nine-Nine" are still on the air -- and then some. "Millers" is one of the highest-rated shows, "Crazy" is one of the most-watched, "Dads" and "Brooklyn" both received full-season orders with the latter earning the coveted post-Super Bowl spot, as well as two Golden Globe nominations. So, aside from ruining my credibility (hey, at least I was right about "Ironside"! ), it does give me hope that "Enlisted" might have a chance. "Enlisted" is in the same vein as "Stripes" and "Police Academy" (the first and second movies, not the crappy sequels). It follows the antics of a bunch of misfits (because, of course) of a Rear Detachment Unit in Florida. At its heart, though, it centres on three brothers reuniting when the eldest one, a super-soldier, is assigned to Rear D after he slugs a colonel in Afghanistan. That would be Geoff Stults ("The Finder") playing now-ex-super-soldier Sgt. Pete Hill. Pete was considered the "good" brother up until that point, following in the footsteps of their super-soldier father who was killed in action. 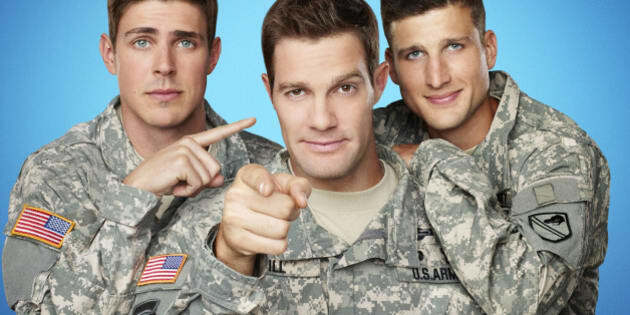 His two brothers -- the sarcastic Derrick (Chris Lowell, "Private Practice") and dim-witted Randy (Parker Young, "Suburgatory") -- have always been in Rear D, mowing lawns, washing tanks and generally keeping the base pristine for the military families living there while their loved ones are serving in overseas combat. It must be noted that despite its goofy exterior, "Enlisted" by no means mocks the military. It just lightens it up. Since I like my laughs served up dry and acerbic, Lowell's character is easily my favourite. He's bitter about his life; hell, he's bitter about almost everything, but I appreciate and identify with that (see: "Brooklyn Nine-Nine" references above). Young's character may as well be called "Ryan," as he's essentially playing the same dude he played in "Suburgatory" (which I'm OK with, just saying). Stults, Lowell and Young make a great team and are solid in the chemistry department. As for the rest of the cast, Angelique Cabral ("Don't Trust The B in Apartment 23") is decent as Pete's love interest and Keith David and his voice are awesome, as per usual. Then there's the rest of the unit, none of whom's names I remember but they did make me smile, particularly the girl doing the dancey-dance jumping jacks, the Donald Duck and Ryan Gosling-loving soon-to-be-divorcée, and the two big guys. In the premiere, which was originally supposed to air in November but Fox pushed it to a proper midseason debut, there's the main storyline -- the brothers reuniting and regaining that bond -- but there's also a subplot involving the unit needing to find a missing dog, as well as the War Games against some random Italians they need to prepare for. I know, I know, it sounds weird and nonsensical but with some time, if Fox allows it, "Enlisted" can develop into a warm and wacky family comedy. Sure, some may find it over-the-top, silly, even cartoonish, but there was something oddly sweet and charming about it. And pairing it with the similarly off-the-wall "Raising Hope" seems like a no-brainer (though what would be better is if "Dads" was gone and "Enlisted" aired after "Brooklyn"). Really, though, as long as creator Kevin Biegel ("Cougar Town") focuses more on the brothers' relationship with some of the crazy hijinks thrown in, and not the other way around, "Enlisted" can do well. "Enlisted" debuts Friday, Jan. 10 at 9:30 p.m. EST on Fox and City.